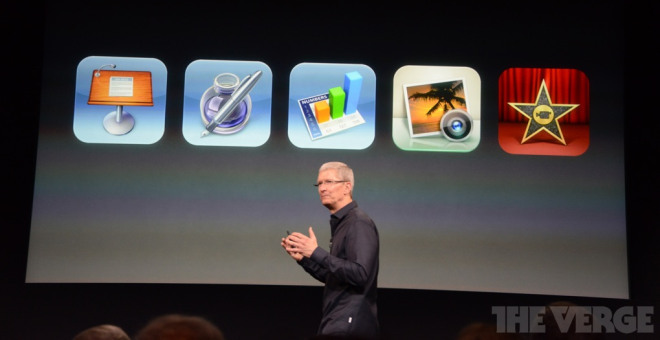 Apple iPhoto, iMovie and the iWork suite for iOS will be free for “all new iOS 7 devices”. That’s the exact sentence Apple uttered so it’s still unclear if existing iDevice users that qualify for an iOS 7 upgrade will also be allowed to get these Apps for free or if they will still have to pay for these Apps. Well, Once you get a new iOS 7-running iPhone, iPad or iPod Touch, the OS will automatically offer you to download those apps for free thereby you will be saving yourself $42 assuming you are not getting them for Free, the $42 is the total price the Apps used to cost altogether.